The world of Gourmet Coffees offers many exotic flavors and experiences. What is the most exotic coffee you have ever had? What is your favorite coffee recipe, and favorite dessert that goes well with gourmet coffees? There is nothing like a well-made Spanish Coffee, particularly if flaming! ​Here is a simple way to create an awesome Spanish coffee. So all you do is first add the rum and Triple Sec to the glass, and light it up! Let it burn for a moment, to hypnotize your guests, and pour in the Kahlua. This will put out the flames. Pour in the coffee, and then add the finishing touches. Viola'! And awesome Spanish Coffee. There is nothing quite like delicious baked desserts, and a great cup of one of your favorite gourmet coffees. We think this is the ideal way to spend your morning break. If you like to cook, here is a great recipe. The best coffee houses have great deserts - but baked desserts made at home are also awesome. The choices now are almost unlimited. You can get really good mixes right in the grocery store - and you can experiment with the recipes, too. Adding your favorite nuts, or a flavoring (like Hazelnut), or drizzle with with a mixture of butter and brown sugar. The best idea is to just try them all, and see what you like! (We are working on a review of the best mixes in grocery stores). One of the best says to add gourmet flavoring to a cup of coffee is to use liquid flavorings. The best ones in our opinion are made by Torani; you have probably seen them in better coffee shops. You can find them in your local store, or online. Then you find one you like, you can save money buying them online. 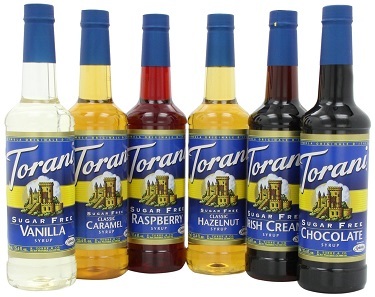 Torani has many flavors including Almond, Amaretto, Blue Curacao, Butter Pecan, Butter Rum, Caramel, Cassis, Chai, Cinnamon, Dark Chocolate, French Vanilla, Hazelnut, Irish Cream, Macademia Nut, and many more. In fact there are over 100 different flavors of coffee syrups from various manufacturers. There are many companies that make gourmet coffee flavorings. To order, click here. Torani has good information about their ingredients and potential allergens. With any food, you should be mindful of the ingredients if you have any allergies or sensitivities. Any good manufacturer will have this information on their website. Mix equal parts of Baileys Irish Cream (which contains alcohol, and is one of the finest Liqueurs ever made! ), Baileys Hazelnut Creamer, and a shot of Espersso. This is a drink like no other. Adjust amounts to fit your taste but be careful, this one can be highly addictive! Our espresso maker is one of the classic aluminum stovetop espresso makers (Click to see) from Italy. Ours is a 3-serving size. We use freshly ground beans, ground fine, and filtered water. It takes 4 minutes to draw the espresso. During this time we heat the creamer. We use a Hazelnut flavored dairy creamer; the fewer the additives, the better the creamer will taste and will be healthier - so we do not recommend sugar-free or fat-free creamers. Pour out exactly 1/3 cup of creamer and warm it in the microwave. Once it is heated, we use a 'frother wand' (Click to see) to foam it up, and then put in the Espresso, to mix with the creamer. Now pour into your serving glasses. If your espresso maker is not the 3cup variety, then you have to modify the amount of creamer. Do not make it too sweet - you still want to taste the espresso! This is so simple, yet it produces the perfect cup of flavored Espresso! We believe in the power of coffee to stimulate our minds, our palates, and our imagination. What is your favorite coffee recipe? Please send it in. Coffee can be enjoyed not only as a morning drink, but an evening drink as well. Coffee cocktails are delicious. Many cultures have discovered this. Because of its dark color and complex, wonderful flavor, coffee is a great addition to the evening. Almost any bottle in the liquor cabinet can be matched to some kind of coffee. Coffee has been described as Smoky, spicy, nutty, earthy, rich, and robust. The Coffee Martini is one of the most common, and delicious. You combine equal amounts of fresh espresso, vodka and the sugar syrup of your choice; some people us, naturally, coffee liqueur. if you use a Rye Vodka it will bring out some of the deeper flavors of the coffee. Another kind of evening coffee drinks is Irish Coffee (made with Whiskey because it has similar smokiness and spiciness). You can also mix Bourbon and Coffee, and add some cream and sugar to taste. On cold winter evenings, the classic White Russian, made with Hot Milk, can be a wonderful drink. Or try mixing Cherry Vodka, Kahlua, and Espresso. So, the basic recipe for a coffee cocktail is equal parts Coffee (or Espresso), alcohol (Vodka, Whiskey, Bourbon, or? ), and a third element such as cream, or a flavored sugar syrup (or even coffee-flavored syrup). Cocktails can be served in a martini glass for added effect, or be served hot in a thick, handcrafted mug. Next time you are feeling creative, try and come up with your own combinations. There are unlimited possibilities. and if you find an awesome recipe, tell us about it and we will publish it here!